By now, all the schools around the country have re-started for the year, which means that a lot of us will have gone back to Mum’s Taxi and Dad’s Taxi duties again. For some of you, your teenager has finally got their provisional license and can drive him/herself to school. This means that there are going to be a lot more cars buzzing around schools, especially at the start and end of the school day. Depending on where you live and what your school does, there may be school buses and shuttles involved as well. In short, there’s a ton of traffic in a small area, and vehicle traffic isn’t the only sort around, as there will also be kids on bikes, kids on scooters and lots of kids walking. In some cases, especially in rural and small-town schools, you can see other forms of transport being used – farm tractors, for example. Nobody wants to make the news by being involved in a horrible accident involving school kids, so it’s probably about time that we thought about a few things we can do to make sure that our kids are safe as they go to and from school. As a quick aside here, this is another area where autonomous cars are a real no-go. Autonomous cars work by predicting what ought to happen or what is likely to happen. Unfortunately, small children can be pretty unpredictable, especially when they’re all excited as they get out of school, and their erratic behaviour hasn’t been programmed into the control centre of an autonomous car. So I’m thankful that the typical Aussie Mum and Dad still drive cars the old-school way! First of all, although the designated school zones – the ones marked with flashy lights, road markings and signs – are the real hot spots, the activity around schools during the pick-up and drop-off times spreads further afield, so don’t just keep alert for kids in the actual areas. The precautions apply for at least a block further than that during busy times. Don’t get in other people’s way. 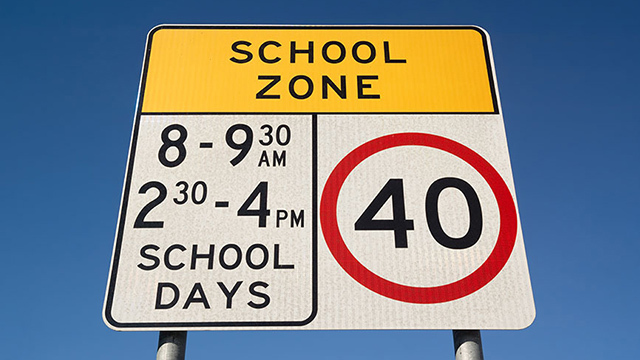 Slowing down to 40 km/h is the law in designated school zones, and failing to do so will (at least in New South Wales) get you double demerit points if the cops catch you at it. The reason for this is simple: if you’re going slowly, you have more time to react and more time to stop when little Bella decides to rush across the road yelling “Mummy! Mummy! Guess what happened at school today!” or when the family dog who came along for the ride whizzes out of the car when little Charlie is putting his schoolbag in the boot. What’s more, if the worst comes to the worst and an accident happens, lower speeds mean less damage. Kids aren’t adults. They are immature. They are impulsive. They are still learning that the world does not revolve around them (and some people seem to never learn this lesson!). Some of them have been sitting down in school for the whole day and have serious ants in their pants. This means that they can do some weird things and they can move quite fast. We can drum the road safety message into them as much as possible, but there will be those moments when they forget it all and rush out into the road, or they’ll be so busy talking to friends that they don’t stop, look and listen. This means that you, as the adult who’s got a driver’s license to prove that you’re responsible, have to be the one on high alert, ready for anything. This means no phones, not even hands-free ones. It probably means switch the radio off and get rid of anything else that could distract you. You may need to be extra careful if your car is an electric vehicle or a hybrid (which will be using the electric motor at school zone speeds). This is because a lot of EVs and hybrids are quieter than petrol and diesel engines, even if they have that little noise (which some older hybrids don’t have). This means that the Listen part of the old Stop, Look and Listen is a bit harder. Even adults can have near misses (that’s me with my hand up here) if they’ve looked one way, looked the other, thought it was clear and didn’t hear the oncoming hybrid/EV and started stepping out. The flip side of this is that if you’re a parent, you should take a few steps to minimise the risk of your child running across the road. This usually means parking on the same side of the road as the school, which is what the official advice says. However, if everybody parks on the same side of the road as the school, the trail of parked cars will stretch well beyond the designated zone. This might mean that your child will have to cross a road to get to where you’re parked. It’s best if you get out of the car and walk to the school gate to collect Bella and Charlie (and the rest of the kids if you’re part of a carpool scheme). You also need to make sure that you’re not the person doing unexpected things. This means no U-turns, no sudden manoeuvres, no three-point turns, etc. Plan your route so these aren’t necessary – and go around the block instead of doing U-turns, etc. The only sudden manoeuvre you’re allowed to make is hitting the brakes if you see a child about to go where they shouldn’t. You can see some people doing silly things around schools, and I’m not talking about the children this time. Yes, I know that you’re in a hurry. I know that you think your child is amazing and you love him/her to bits. I know that you’ve got to scream across town for soccer practice. However, there is no excuse for parking in the school bus zone, double-parking or parking really, really close to the school crossing point. It’s absolute chaos when every single Parent’s Taxi tries to park as close to the school gate as legally possible. Congestion near schools during the busy times is a bit of a problem that councils and schools are trying hard to address because it can be chaos and an accident waiting to happen. My preference (at least when my kids were still at school and didn’t drive themselves) was to park a bit further away, then walk that extra block or so. After all, it won’t hurt you or your kids to walk a little! I’d also strongly argue for other initiatives as well as a way of reducing congestion around schools. Setting up a carpool scheme with other parents who live near you is a popular option and it means that instead of four cars arriving with one child each, you get one car with four kids. Walking school buses and “Kiss and Ride” drop-off spots are other options. Of course, if you live within 2 km of the school, then walking to and from the school is an option (and it’s free!). You’ll need to walk with your child until he/she is old enough to have the street smarts to do it solo – and this is usually the age when they are embarrassed to be seen with parents, so that works out well. If you haven’t got school aged children and you’re not doing the Parent’s Taxi run, then it’s best to plan your journey so that you don’t have to drive near a school during the busy hours. Go another way if you have to or make that trip at another time. If we all do our bit, then our kids will stay safe as they go to and from school.